I’ve translated several books for Polity Press, an Oxford-based publisher that specializes in the social sciences. It was somewhat by chance that I started working for them: the first book I ever translated was picked up by them for publication, and I guess they liked my style because they’ve been offering me translation jobs ever since. I finished translating my third book for them, Ordinary Organizations, back in October 2015. I pride myself on meeting my deadlines, even big book deadlines, so I worked frantically to be able to send off the manuscript by October 30th, as I had promised. October 30th happened to be a Friday, which I belatedly realized was kind of a silly deadline because nobody was going to do anything with the manuscript over the weekend—but I sent it off anyway and, as always, I felt a wave of relief once it was out of my hands. Somewhat to my surprise, I got an email back from my contact at the publisher that same evening. He thanked me for sending the translation and then asked if I might be interested in another upcoming project, “namely Victor Klemperer’s Revolutionstagebuch 1919…” Everything after that was drowned out by a high-pitched ringing in my head, which gradually coalesced into a single, stunned thought: THEY WANT ME TO TRANLATE KLEMPERER! THEY WANT ME TO TRANSLATE KLEMPERER! THEY WANT ME TO TRANSLATE KLEMPERER! 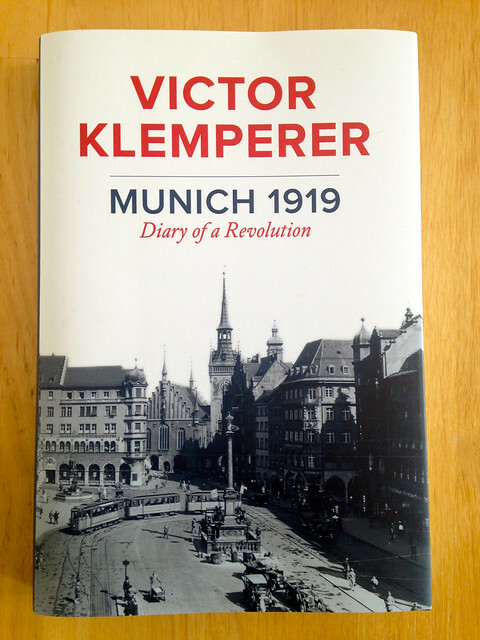 A bit of context: Victor Klemperer was a German academic who lived through World War II and meticulously documented what life was like under the Nazis for a German of Jewish descent (his family was Jewish, but he had converted to Protestantism as a young man—not that the Nazis cared). His Nazi-era diaries were published in German in the mid-1990s and then in English a few years later, and they were a huge sensation in both cases (at least among the people who are interested in these kinds of things, I suppose). They’re now considered a standard historical source text and a priceless document of the period. Heck, they were even turned into a German TV series. In other words, Victor Klemperer is Kind Of A Big Deal. 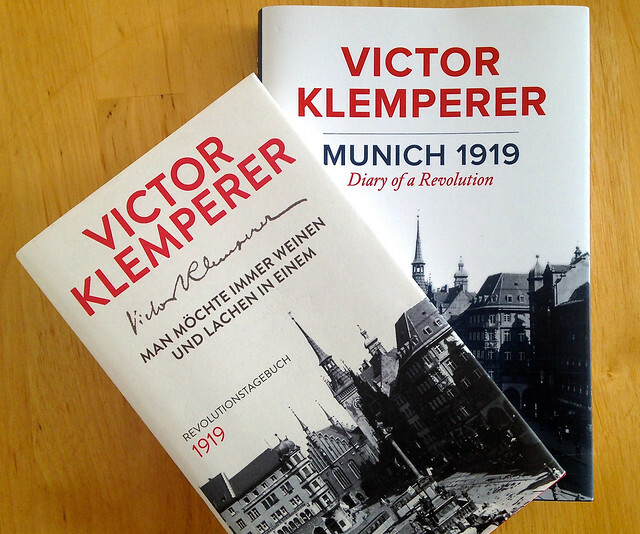 I hadn’t actually known that a new Klemperer book had been published in Germany in 2015—consisting of newspaper articles he wrote in Munich during the German revolution of 1919 and previously unpublished diary entries written in 1942 looking back on the revolution—so when I did a quick search and saw all the positive coverage the book had received in the German press (“a publishing sensation!”), my heart started racing, whether in panic or excitement I’m not sure. I was—to use the technical phrase—freaking out. I immediately texted Jeremy and was like “OMG” and he was like “OMG” and I wrote straight back to the publisher and said “That is absolutely something I would be interested in!” I didn’t hear back immediately, and when I eventually had to leave the house to meet Jeremy for dinner, I started to obsess over whether I had accidentally written back “That is absolutely NOT something I would be interested in”—at which point I had to stop on the street in the dark and check my sent emails on my phone, just to be sure. Of course, it was all okay, and the publisher wrote back the following week and basically said, “Okay, let’s do this”—and so we started to do it. Translating and publishing a book is a slooow process. First I had to translate a sample of the text, which then went to two reviewers and finally to the German publisher for approval. I worked on the sample during a quick vacation with my parents in Florida in November and then sent it back to the publisher at the start of December. The translation was tough. Really tough. A type of language and style I wasn’t used to at all: journalistic writing from the early 20th century and first-person narrative from the mid-20th century. The first newspaper article was a killer, with surprisingly tortuous prose and a slew of names and events I had absolutely no knowledge of. I felt like I had to learn the entire history of Weimar Germany to get a handle on it at all. And once I got started, I realized I was terrified of the whole thing, terrified of having been entrusted not just with Klemperer’s writing but with his voice, with him. I had to represent him on the page, and I suddenly didn’t feel up to it. I grappled with the tone of his prose, with the long sentences, with the oblique references to things I didn’t understand. It was a challenge, and not exactly in a good way. But I did the best I thought I could, and I sent off the sample—and then it was radio silence for AGES. Nobody would be working over Christmas, of course, and once the reviewers had received the text it would take some time for them to work through it and get it back to me. As time ticked on, I started to wonder if this was really going to happen, and I started to prime myself for the possibility that it maybe wasn’t. Finally, at the end of January, I got the reviewers’ comments back. The email from the publisher said they were “largely positive” and there were “no major issues,” but when I read the reviews themselves, I felt like my translation had been…eviscerated. I felt eviscerated. Admittedly, I find it quite hard to take criticism under the least demanding of circumstances, so with something this important, something I had worked on so hard, it was like seeing a big FAIL stamped across my text. As I read those words, I realized I had been given exactly that: not one but two “editors” who had gone through my work meticulously, pointing out all awkwardness—and if I didn’t accept their invitation to reconsider and reflect, then I was only hurting myself. That was the turning point, the point at which I was able to sit down with my translation again, and read the reviewers’ comments with clear eyes, and realize that, yes, in many cases, they were on the mark. Not necessarily all cases; another important realization at this point was that I’m a professional and an expert myself, and as such I can make my own choices. Those choices may not always resonate with others, but if they are informed and deliberate choices, then I will stand by them. So I revised, and I sent off the translation again, and I waited for a few painful weeks, during which I told myself that if the German publisher didn’t like the translation then it just wasn’t meant to be, and that was okay. Not every translator is suited to every text. It doesn’t mean that you’re not good at what you do, it just means that your particular style or approach doesn’t fit with what a publisher or author is looking for. And even though I knew I’d be crushed if I didn’t get the job, I tried to prepare myself as best as I could for that possibility and just get on with my life. And then my publisher wrote back with the green light from the German publisher, and suddenly I was signing the contract to translate Victor Klemperer. Fast-forward a year and a half, to a few evenings ago, when my neighbor came by with a box that a deliveryman had left with her while I was out. I knew from the size and shape of it exactly what it was (the big WILEY printed on the side might have given it away had I actually seen it before tearing the box open). Sure enough, under a ridiculous amount of paper padding, there were five beautiful hardback copies of Munich 1919: Diary of a Revolution, written by Victor Klemperer, translated by Jessica Spengler. My hands might have shaken a bit as I lifted them out. 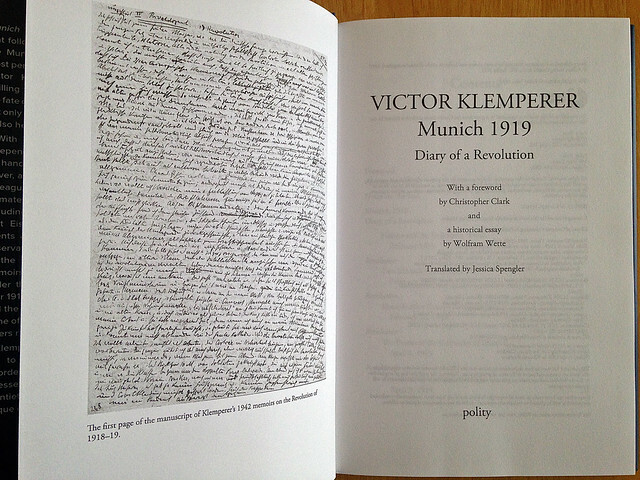 Over dinner in London a few weeks ago, my dear friend Schorsch (a fellow translator and my partner on many of the projects I’m most proud of) said: “You’re Victor Klemperer’s new translator”—and I just had to sit with that for a while. I’m still sitting with it, to be honest. A part of me still can’t quite believe that I was entrusted with this, that this book is real, that my name is there with Victor’s on the title page (yes, after spending so many months inside his head, I’m very much on first-name terms with Victor). I’m very proud, I’m very honored, and most of all, I hope Victor would approve. I started keeping a sort of “translation diary” as I was working on the book. It’s mostly just hastily typed notes about linguistic issues that cropped up, along with some bits about how I felt at various times during the project. It ends abruptly in January 2017, because that was pretty much the last time I had anything to do with the book before it was released. These notes might only be of limited interest to most folks, but I’m publishing them here anyway because they give a tiny bit of insight into the translation process and what has been occupying my mind for the past year (almost to the day!). June 4: Spent probably half an hour today trying to find out what Mantelhängerei means. After searching for ages and sifting through scans of old Fraktur-type books on Google Books, I managed to triangulate enough to determine it was somehow related to “flattery” or “smooth-taking.” Finally, somehow, I wound up on archive.org looking at the text of the Jahrbuch des Vereins für Niederdeutsche Sprache from 1877, where I found the following: “Haikenheuger, mantelhänger, der dem mantel nach dem winde hängt.” Cue a quick Google of “Mantel nach dem Winde hängen” and, lo and behold, on the wonderful redensarten-index.de, I find that it’s an old German idiom basically meaning “choosing sides by seeing which way the wind is blowing”—being opportunistic or unprincipled, in other words. I actually whooped a bit when I finally deciphered it. Still don’t have a good translation though—might have to stick with “opportunism.” Then there’s Modeäfferei, which is equally problematic. I’ve got “folly” for the time being. You feel like you’re spending time with the man himself. I like him. I’m going to miss him when this is done. June 24: EU referendum yesterday, woke up today to find that Britain has turned its back on the EU. Pound plummets, Prime Minister resigns, Scotland wants out, no one knows what’s going to happen, everything feels like it’s falling apart. And in post-WWI Munich everything is falling apart too: the Munich communists murdered innocent hostages, the “Prussian” troops have stormed in and are fighting it out in the city with the remains of the Council Republic, there are explosions, machine-gun fire, confusion. All of the political turmoil that was blithely indulged has come to a head, and now no one can laugh it off anymore because everything has truly gone to hell. Feels frighteningly on the money. Also especially notable: no one knew exactly what was happening because there were no newspapers, no radio, no outside information of any kind—they relied solely on rumor and hearsay. Klemperer describes people coming to blows over the few copies of newspapers that were available. And today I can sit at my computer and immediately find out what’s happening in the most of the world and how everyone feels about it. Aug. 25: Tricky things all through the book: coming across phrases/words I don’t entirely understand and not knowing whether they’re archaic, dialect, literary references, things made up by Klemperer himself. Lots of literary references in here that your average English reader wouldn’t get: Goethe, Schiller, etc. I’ve been suggesting footnotes. The book was originally due at the end of August. I’ve asked for another week, partially because I find myself rushing through it, partially because Jeremy was sick as a dog when I got back from Florida (virus that turned into bronchitis) and now, as it turns out, I have the virus too. Ibuprofen is getting me through—I’m sitting at the computer in my PJs as I type this, dripping with sweat, coasting on drugs and caffeine. They’ll wear off in a few hours and I’ll feel like crap again, so I have to get as much done now as is humanly possible. Not ideal. Aug. 31: Solving foreign-language grammar problems can be like cracking a code—and when you do finally crack it, with an actual “OOOOHH!”, it’s a brilliant feeling. Today’s surprisingly tricky word: beider. “Annemarie Köhler, ein sehr niedliches lebenslustiges Mädchen im Anfang der Zwanzig, war Scherners Mitschülerin, Johannes Thieme, ein verhungerter magerer Junge von 18 Jahren, beider Mathematiklehrer auf der Presse.” Didn’t pay attention the first time around and translated this as “both of them math teachers at the cram school” (the “cram school,” incidentally, was another stumbling block the first time around—it was referred to as “die Presse” in German, and I was thrilled to establish that “cram school” was not an anachronism here, because I didn’t know what else to call it). Upon re-reading, I couldn’t figure out why the woman would have been teaching math if she was studying to be a doctor. Sat puzzled, then realized beider was in the genitive case—ok, but it still means “both,” so what’s it referring to? Trawl every dictionary for some clue that it might be used in another way, wonder if it’s a typo, wonder if it’s a misprint, consider fudging it and just writing “a math teacher at the cram school”—then suddenly, “OOOOHH!” — THEIR math teacher, meaning Scherner and Annemarie Köhler. Yisssss. Sept. 29: I’m sitting in a café in Oslo, after spending a glorious morning at the Munch museum, tanking up with coffee and a pastry to fuel me through the afternoon that I plan to spend at the National Gallery. And it’s Thursday, and I’m expecting the review of my full Klemperer translation sometime during the week, and I know it’s unwise, but I check my email on my phone, and sure enough, there’s an email from the publisher, and I know it’s even more unwise, but I open it to find that the review is, indeed, attached, and I know it’s the dumbest thing ever to do in a café, on my phone, when I’m about to spend an afternoon filled with art, but I can’t help myself and I open the Word doc and read the first half of the first sentence of the review—“The present translation is reasonably good…”—and my heart sinks to my feet. I go on to read the full 7-page review, but nothing sticks in my mind other than “reasonably good.” The translation that I have poured my heart and soul into over the course of 8 months. “Reasonably good.” I finish my coffee, go the museum, snap at the security guard who makes me put my bag in a locker, glare at everyone in the first rooms of the gallery, stand in front of some painting or another, staring blankly at it, thinking about my “reasonably good” translation, trying not to cry—and then I give myself a mental slap. I am in Oslo for one day. I am in the National Gallery of Norway. The National Gallery has a world-class collection of works by Norwegian artists such as my beloved Munch, along with magnificent medieval paintings, paintings by Dutch masters, Impressionists, 19th-century Romantic landscape artists… and I’m not really seeing any of it. So I pull myself together, put my translation out of my mind, put myself back in the present moment, and have the most moving, exciting, immersive experience at the wonderful museum. And eventually, when I am back home, I steel myself for revising the translation. I look at the reviewer’s notes again, and this time actually read what comes after the “reasonably good”—namely: “with many well-turned phrases and elegantly mastered translation puzzles.” Elegantly mastered translation puzzles! The translation is not a failure. I am not a failure. The translation is good, but it can be improved, just like every translation on earth, just like every piece of writing on earth. I sit, and I improve it, and upon re-reading and re-reading again, I realize that it really is good, that I really am proud of it, that I think I’ve done Victor justice, that I’m more happy with it than maybe with anything else I’ve translated. I’ve gotten the revision done faster than expected. It goes back to the publisher next week, and then we take things from there. It’s all going to be okay. October 12: I must be the only translator in the history of the world who is sad about getting paid. I got my remittance notice from the publisher yesterday, faster than ever before. This is good in that it means my translation has been “accepted” and my job is done. And it’s sad in that it means my job is done. With the exception of some copyediting, and maybe checking over some cover text at some point, Victor is no longer mine. Almost a year of my life (from the time I was first asked to do a sample translation, to the time I received the payment). Eight solid months of pouring my heart and soul into a text. Months of getting to know Victor, getting to like Victor. At some point near the end of the translation, I came across a photo of him from 1955, at a ceremony honoring Thomas Mann. He’s 74, slightly stooped, dressed very nattily in a pin-stripe suit, with his pretty, MUCH younger (second) wife, Hadwig, next to him. He looks somewhat frail, though I think that’s deceptive; he was still very active at the time, teaching, writing, taking study trips and serving in various cultural organizations. But I looked and looked at him in the picture, and I started to cry. I can’t really say why, other than that it was like looking at an old picture of a long-gone relative, someone I wish I had known better, and it filled me with a strange melancholy. I still feel it now—and all the more acutely since he really is gone from my life at the moment. This is a bit of a limbo period. At some point I’ll have the published book in my hands, and it will be sent out into the world, and other people will get to know this Victor (not as well as I know him—he’s been living in my head for months, and no one knows an author like their translator). The work will have a life beyond me, and I look forward to that. But right now, I just have a remittance notice. And it’s cold comfort. January 8, 2017: We’re at the final stage now: I’m checking the proofs before they’re printed. I find this bit quite stressful because it’s the last chance I have to catch any mistakes/make any (minor) changes. After this, I won’t see the translation again until the printed book is in my hands. At which point I’ll undoubtedly find some typos I missed and sentences I wish I could rewrite. One thing that was cleared up only fairly recently: the case of Sonja Lerch, “die arme Sonja” [poor Sonja], deceased wife of one of Klemperer’s colleagues, who is mentioned only in passing by Klemperer himself and then in a tiny bit more detail in one of the footnotes in the book. Sonja was politically active, and she organized a munitions worker strike with Kurt Eisner in January 1918, which led to her being arrested. While she was still in prison, she and her husband divorced and, tragically, she committed suicide. The German footnote in the book made it sound as though she had requested the divorce from her husband, but as I researched her, I started to doubt this take on the story (because the few sources of information I could find about her claimed that her husband is the one who wanted the divorce—and may have actually publicly announced that he was divorcing her before he even spoke to her privately about it, because he worried she would harm his career). I flagged up the footnote for the publisher, just saying, “Um, I’m not sure about this…”, and my contact at the publisher asked if I could point him to the relevant part of the Klemperer text, so I sent a ridiculously lengthy email to explain my doubts, quoting Kurt Eisner’s collected writings, academic articles about Ernst Toller, and references to a notice in a Munich newspaper in April 1918 [PS: I actually love this kind of detective work]. To my great relief (and the publisher’s great credit), my contact took my concerns on board, proposed a more neutral wording for the footnote, and said he would notify the German publisher as well—and to the German publisher’s credit, they forwarded the note to their editor. And I could finally rest easy, knowing that we weren’t doing “poor Sonja” an injustice. Congratulations. What an extraordinary achievement. And a beautiful telling of your experience. So happy for you. A.
Congratulations, what an achievement! I don’t know much about translation, but especially love the idea that everyone needs a good editor, no matter what they do, who invites them to reconsider and reflect.